I needed a small synth that I could easily take on an airplane. 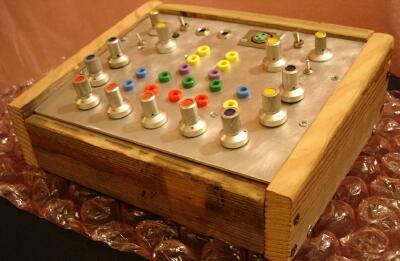 I built this synth in a simple and straight-forward way, using 8038 chips for the oscillators and plenty of op-amps. I found a trick with the 8038, you can drive the sine distortion trim pin from a voltage source, for vc waveshape! But the true magic is a diode bridge vca, like in the Korg MS50. Why didn't I ever build this before? It's a very special intermodulation! Two oscillators, noise, and a mic preamp all swimming around each other, it runs on 2 9-volt batteries, it's my favorite so far!